The traveling lifestyle is an invigorating option for those who are ready to embrace it. Thanks to bold bloggers who are happy to romanticize their experience and authors who boast of how easy it is to move away from a traditional career, ditching the nine-to-five to take off and travel the world is becoming increasingly popular. If you’re considering this bold move, there are some important questions you should ask yourself before making the final decision. What’s on Your Material Wish List? Consider the material items that are most important to you, starting big and working your way down. Do you enjoy having a comfortable house and luxury car? How about a sleek entertainment center and soft bed? Do you luxuriate in a large closet and prefer luxe bath products? If you quit your job for a life of travelling, you’ll probably have to say goodbye to all these things and many more. If your greatest ambition is still to decorate your home, landscape the yard, and otherwise settle in to a stable lifestyle, going abroad probably isn’t for you. What Experiences Do You Hope to Capture? It’s important to define exactly why you’re drawn to the idea of traveling. Keeping these goals in mind will help you muscle through the hard hostel bunks, questionable street food, and hours of uncomfortable transportation. 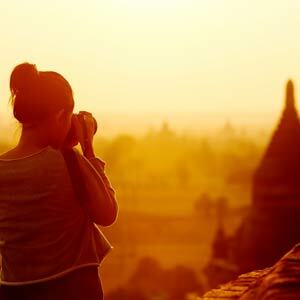 If you truly want to experience these things, travelling could be perfect for you. If, however, you simply want to travel so you’ll have new stories to share at dinner parties or to make yourself seem more exotic and interesting, you may find that there are better ways to do it. Many goals can be accomplished in a series of short trips with plusher accommodations, rather than a long stint overseas. If you’re not quite sure what you’re searching for, a psychic hotline could give you some powerful answers. Is home the place where you keep your things? Is it where your friends and family are? If you enjoy a cozy burrow and familiar surroundings, stop and really consider whether you want to give it all up. If you’re just desperate to get away from your job, you can do that without committing to a traveling lifestyle. If your home goes with you wherever you are, you’ll have no problem feeling cozy and content in a series of strange hotels, hostels, or host homes. Those with the traveler’s spirit can make a home nearly anywhere. How do you plan to finance your travels? Do you have enough savings to travel simply for a few months or years? If not, you’ll have to consider the kind of work that you’ll do abroad. Speaking with a phone psychic can point you in the right direction if you’re looking for work. Giving up a career for travel is a big decision. Take the time to consider all sides of the situation before committing to a plan of action.